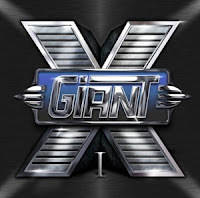 The Giant X project was formed by the two German guitarists and songwriters Peter Joy Jordan and Rolf Kasparek. The latter better known as Rock'N Rolf - founder and creator of your all-time favorite pirate metal band, RUNNING WILD. Jorden joined the merry-jolly crew of pirates in 2005 and the lads decided to record this side-project as the tribute to late seventies and (mostly) eighties party hard rock. 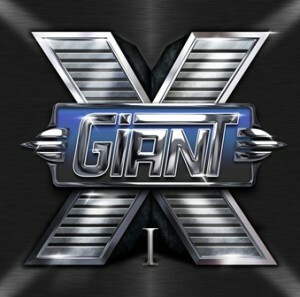 The dodgy entitled "I" and its compositions are supposed to capture the true essence of melodic hard rock and party metal? Several tracks are extremely catchy indeed and more towards "Hair-Metal" and the rock of eighties Quiet Riot, WASP, and Scorpions. Others are not quite as interesting, simply because they'll remind you of a lighter version of Running Wild. The opening track (after the short intro) sadly the perfect example of being "too similar to the concept of Pirate Metal" and Rolf even breaks out into his typical 'yeah-ehh-yeah' call. The last thing you need is a side-project that sounds like your full-time band. Not too shabby... but better suited on the Running Wild album. Fast forward to the fun rock of "Don't Quit Till Tomorrow" with its mind-blowing refrain in the style of Bonfire and/or Scorpions 'ala Savage Amusement. Woh-oh-oh's and lyric that goes along the lines of 'Raise your hands to Rock N Roll' will soon bring a big grin on yer sad little face. "Nameless Heroes", the fun but rather typical MTV power ballad 'ala Cinderella and Scorpions with its catchy refrain and lighters-in-the-air formula. Ehem, the lighters are obviously all replaced by various cellphones nowadays. "Go 4 It" and "The Count" had me instantly thinking about Quiet Riot and their party-metal of the mid/late eighties. "Rough Ride" blend everything from Motley Crue (Girls x3 era) to WASP, and Running Wild. Hardly everything that glitter is (pirate) gold. I believe they could have included a couple of more tunes in the style of "Don't Quit Till Tomorrow" or "R.O.C.K.". You know, to really capture the mood of the grand 80's era of big hair and spandex.